The rocks are dumped on top of each other leaving gaps between them that allow water to flow through. This disperses the energy of the waves and reduces their erosional power. They can be very effective. The boulders must be large, strong and resistant to erosion. Granite and basalt are often used. Small or weak rocks would not be able to withstand the impact from the waves and would quickly be eroded. Expensive but easier and quicker and cheaper to construct than concrete sea walls. Here we can see riprap adjacent to a concrete wall on the Cornish coast. The wall runs below a road and protects the soft cliff rocks from the sea at a spot where the waves hit it at an angle and are particularly erosive. As the coast bends away from the tourist beach and road, the wall is replaced by rip rap that is capable of withstanding the direct impact of the waves, is less expensive than the concrete wall,and discourages tourists from entering an area considered to be unsafe. RipRap may use local material if it is available or, as at Hengisbury Head, use rocks from places as far away as Norway. It can be used in a line along the base of the cliff, distributed across the beach to weaken the effect of waves, or in lines going down the beach that act as groynes. At Hengisbury Head,riprap is used in severl different ways. If forms a barrier along the base of some areas of vulnerable cliffs, stopping the waves from undercutting the base of the cliff. In this photograph the riprap has been positioned to act as a barrier to storm waves and very high tides, reducing the power of the waves without forming a large and expensive barrier that wouldnotbe needed formost ofthe time. It also acts as an obvious safety barrier,keeping curious tourists away from the unstable cliffs. RipRap isnt just used along the top of beachs and the base of cliffs. It can also be used to form groynes, both as loose rock and in wire gabions. 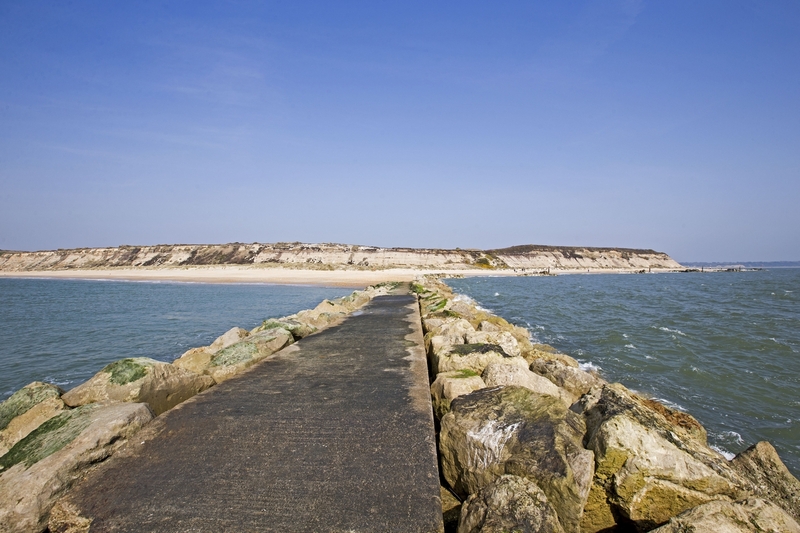 Traditional wooden groynes are more common in the UK but riprap groynes have some advantages over wooden structures. They can be built on a larger scale (wider, longer and deeper), they require no foundations, can have access ways and paths built on top of them, they tend to look more ‘natural’ in tourist locations, and require almost no maintainance. 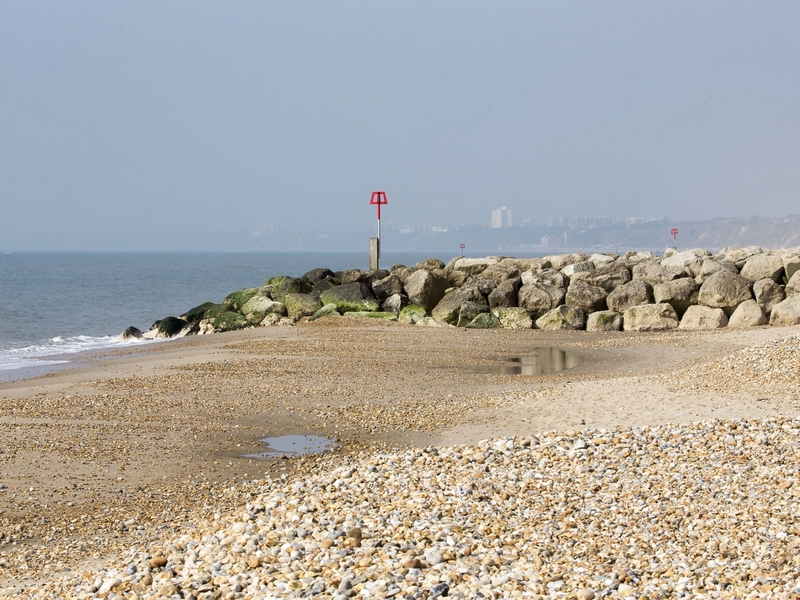 The life expectancy of a riprap groyne is greater than that of a wooden one. On the other hand, riprap is more expensive to buy and to position. For example,riprap at Hengisbury Head came all the way from Norway and was dropped from special barges. 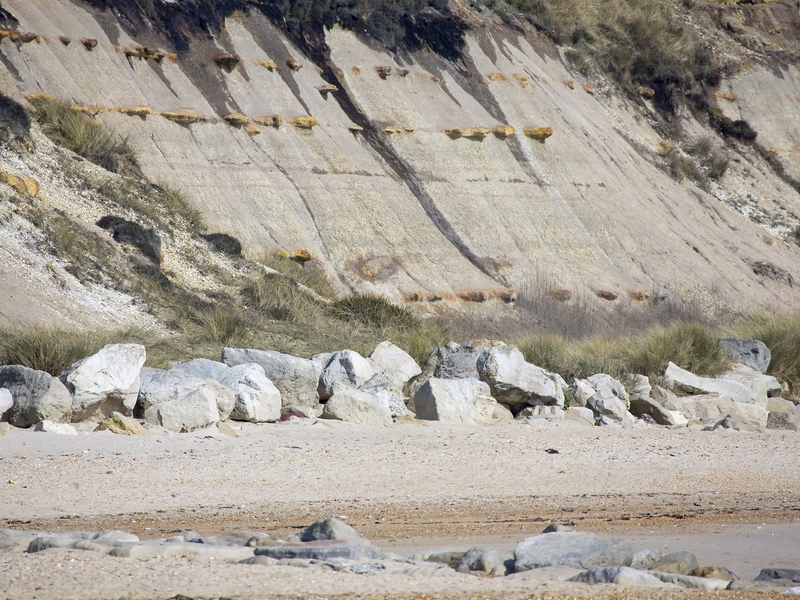 At Overstrand in Norfolk the riprap also came from Norway and cost £1,300 per boulder. 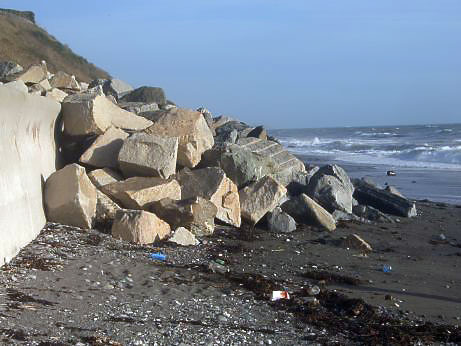 RipRap is an effective way to provide additional protection to other coastal defence structures, and to man-made features such as harbour walls and pipes discharging into the sea. The rocks reduce the power of the waves hitting the structure and also disguise obviously man-made structures, help them to blend into the natural environment. This feature, probably a pipe discharging into the sea, also acts as a groyne combatting longshore drift. Note the choppy water on the right, the protected and calmer water on the left, and the much wider beach built up on the protected side of the groyne.